This is a review of a split album between United Kingdom's Forefather and The meads Of Asphodel called "English Steel" which was released by Godreah Records and we will start off the review with Forefather which continues the Anglo Saxon style of pagan metal from previous releases. Their side of the split starts out with a very heavy pagan sound along with some melodic guitar leads and the riffs also use a great amount of melody while you can also hear all of the musical instruments that at e present on their side of the recording and after awhile grim black metal screams make their presence known. Melodic pagan vocals are added into their songs quite a bit throughout the split and traditional metal influences are also utilized at times and as their side of t he split progresses acoustic guitars are also used briefly and they also add in a touch of folk music and when the music finally speeds up a decent amount of tremolo picking and blast beats can be heard which also gives the music a more raw black metal feeling and synths are added onto the closing track which is also an instrumental. 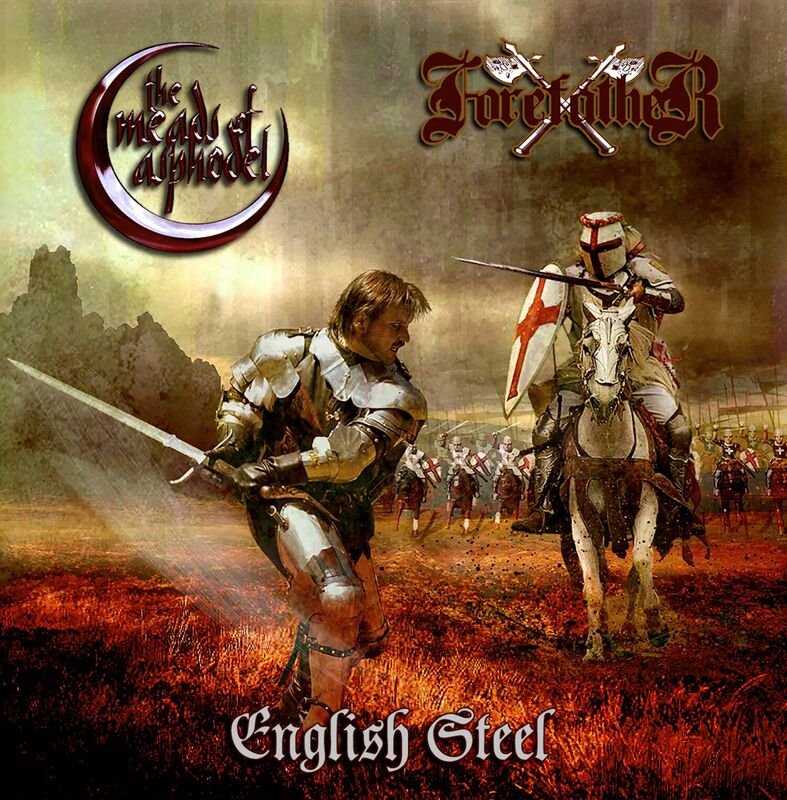 Forefather creates another recording that remains true to the Anglo Saxon style of metal established on previous releases, the production sounds very professional while the lyrics cover Anglo Saxon History and Heritage. In my opinion this is another great sounding recording f rom Forefather and if you are a fan of this band, you should check out their side of the split. RECOMMENDED TRACKS INCLUDE "Two Sacred Oaks" and "In Victory We Feast". Next up is The Meads Of Asphodel another band that h as been featured before in this zine and plays an experimental style of black metal on this recording. Their side of the split starts out with folk instruments and a medieval atmosphere and after the intro the music goes into a very fast and raw musical direction along with a great amount of g rim yet high pitched black metal screams and blast beats and atmospheric synths a re also added to the heavier sections of the songs. After awhile the music gets more experimental and acoustic guitars are also used briefly while some tracks also adds in a small amount of spoken word parts and clear male vocals and the songs also bring in a great mixture of slow, mid paced and fast parts while also adding in Candi, Stanton, Sham 69, The Saints and Desaster covers which also display elements of punk rock. The Meads Of Asphodel creates another recording that remains true to the experimental style of black metal from previous releases, the production sounds very professional while the lyrics cover Anti Religion, Bible Apocrypha, Death and War themes. In my opinion this is another great sounding recording from The Meads Of Asphodel a nd if you are a fan of this band, you should check out their side of the split. RECOMMENDED TRACKS INCLUDE "Infidel" and "Perfect Day". In conclusion I feel this is a very great sounding split and would recommend it to all fans of black and pagan metal, 8 out of 10.